The world lost one of its great leaders when Czech Republic leader Vaclav Havel died, but after his death, a few on the left could not contain themselves. One leftist, Neil Clark, claimed, “Havel did not help make his country and the world a better place.” Clark goes on to note that Havel’s critique against the old regime did not account for previous communist regime accomplishments in the fields of employment, general welfare, including women rights, and education. In Clark’s mind, communism put the need of the people first. For Havel, who lived under the slavery of communism, this was nonsense, but Clark's response shows what many on the left have descended to. They have descended to tolerance for totalitarian impulses if the cause is right. In the beginning of the Obama Administration, Anita Dunn praised Mao and Mother Teresa in the same sentence and there was the Obama’s appointment of Van Jones, a self-admitted former communist and unrepentant Marxist demonstrating the intellectual rot that occupied the left on its intellectual decline. The fact that anyone still listens to Van Jones is enough of an indictment as one pundit wrote that anyone who defends communism should be treated like anyone who defended Nazism, with contempt. 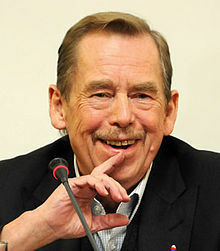 As for Havel himself, he was one of the true freedom fighters in Central Europe, a voice for freedom. Of freedom, he wrote, “I am in favor of a political system based on the citizen, and recognizing his entire fundamental civil and human rights in their universal validity, and equally applied. The sovereignty of the community, the region, the nation, the state–any higher sovereignty, in fact–makes sense only if it is derived from the one genuine sovereignty, that is, from human sovereignty, which finds its political expression in civic sovereignty.” This doesn’t mean he did not have his disagreement with his successor Vaclav Klaus on how far free market reform should go when he noted, “Though my heart be left of centre, I have always known that the only economic system that works is a market economy, in which everything belongs to someone–which means that someone is responsible for everything. It is a system in which complete independence and plurality of economic entities exist within a legal framework, and its workings are guided chiefly by the laws of the marketplace. This is the only natural economy, the only kind that makes sense, the only one that can lead to prosperity, because it is the only one that reflects the nature of life itself.” Havel began his life as a playwright, but he used his talent to resist one of the more repressive regimes in Central Europe and as President, he helped move the country to a democratic capitalistic state. Today, the biggest threat to Europe is a soft authoritarian state run from Brussels over the entire continent as the welfare state implodes along with the Euro. For the European elites, the only way to save the Euro is to have a central authority to be able to control the economic policies of some 27 nations within Europe. Havel was the voice against the perfect totalitarian and now voices are required to fight the next battle for freedom including economic freedom.